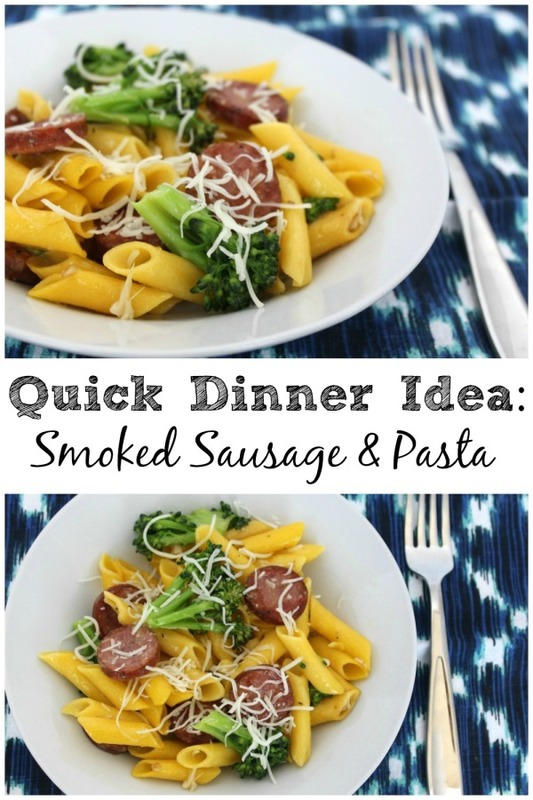 I’m excited to start sharing some Quick Dinner Ideas with you, because that’s what I’m all about these days! On most days, I need dinner on the table in about 30 minutes. You too? Great! I hope you’ll find these recipes useful and as tasty as my family does. 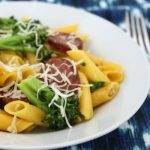 I not only love the way this Smoked Sausage and Pasta with Broccoli dish tastes, I love the way it looks. The green just pops and this has been an easy way to get my family to eat some broccoli. The key is to throw the broccoli in the pot of boiling pasta about 2 minutes before it’s done. The broccoli turns a gorgeous bright green and it’s not mushy, but instead crisp and flavorful. The other thing that kicks this pasta up a notch is lemon zest and lemon juice. 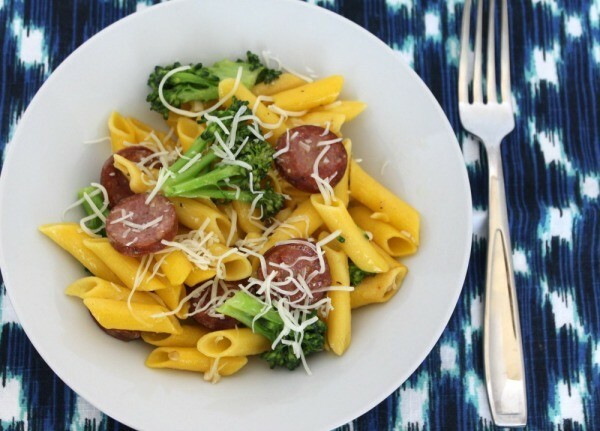 It gives it a slight citrus flavor which goes fantastic with the minced garlic and broccoli. Are you hungry yet? I always make extra of this so we have it for leftovers. It’s perfect for lunch the next day. Serve this up nice and warm with some cheese sprinkled on top, and you have a meal your family will ask for over and over again. Serve it with warm bread and fresh fruit and wow, just wow. Now for that recipe! For more quick dinner ideas see my Smoked Sausage, Pepper and Potato Hash recipe and this very easy Chicken Stir Fry recipe. 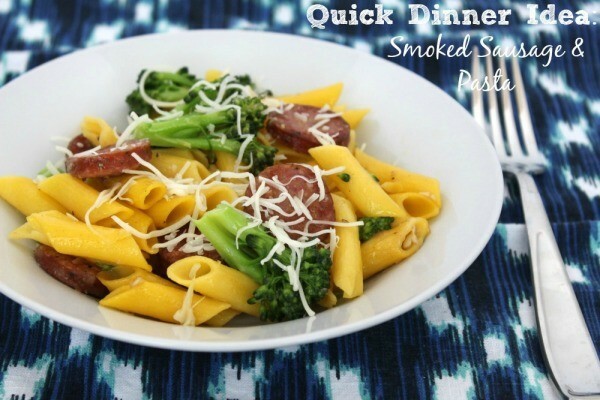 A fast, easy and delicious meal you can serve your family in under 30 minutes. The smoked sausage, broccoli and lemon flavors all compliment each other so well. 2. In the last 2 minutes of cooking, add the broccoli florets and cook until bright green and tender. Reserve 1 cup of pasta water for sauce. 3. While pasta is cooking, whisk together the olive oil, garlic, lemon zest, lemon juice, 1/2 tsp salt and 1/4 tsp pepper. 4. Cook smoked sausage in a skillet until both sides are browned. Add the garlic mixture and cook for about 1 minute. Do not let the garlic burn! Remove from heat. 5. Drain pasta and broccoli when it's done. Don't forget to reserve that cup of pasta water! 6. 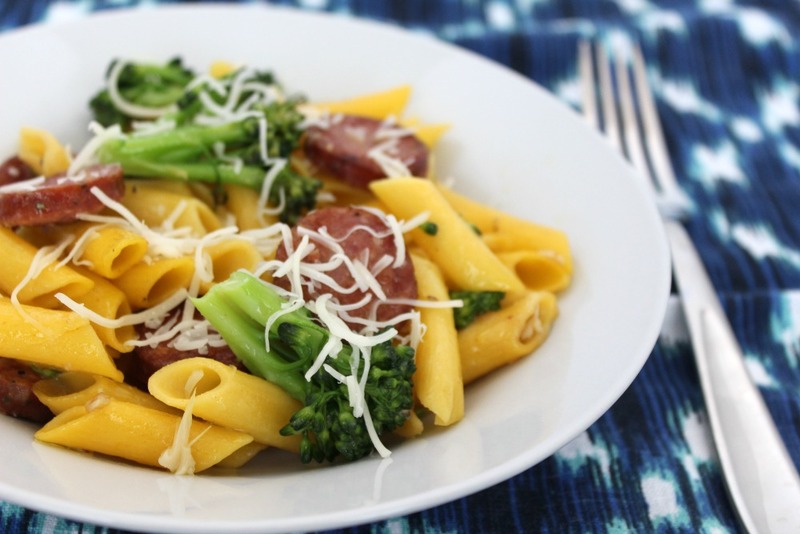 Add pasta and broccoli to the sausage in the skillet. Pour over the pasta water and stir everything together. 7. Serve with grated Parmesan or a blend of Italian cheeses.